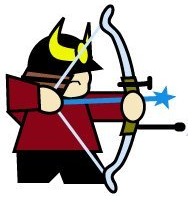 I shot competitive Olympic-style archery for several years, particularly while I was working on my first master's degree at the University of Tulsa (my family is of samurai caste, so it's only natural!). I shot well enough to become a Collegiate All American in 1998 and represented the U.S. at the Yamaha Cup in Japan (Justin Huish won the tournament that year; they invited me back in 1999). My home club at the time was the Tulsa Archery Association (which actually produced two All-Americans that year). I was also invited to both Olympic Training Centers (Colorado Springs and Chula Vista) and got to study under some of the best coaches in the world. I had some great sponsors such as Beiter, Precision Archery/Doinker, and X-Ring. I was also a level two-certified coach! To the left was a logo custom-made for me by my most wonderful and talented cousin in Japan! I used both a Sky Conquest and a Yamaha Super Feel Forged bow, both usually weighted between 40 and 42 lbs of pull at 28, but my draw length was around 33" at time time. Retired equipment in light gray. Retired: Uukha Vx, X-Curve 1000, Medium #46. Bosen RC-5 "Double Carbon / Bamboo" limbs, #50 limbs (Run #52.5, though as I think they're measured at bolts out, 26.25"). Intech-3 Stabilizers, Some old (Easton? Doinker?) .5"x2.5" aluminum extender with Doinker 3/4" dampeners. (Intech-3 stabilizers have built-in dampeners, but I wanted to make these slightly longer, so I added the Doinker.). The main rod's built-in dampener has been deleted. Yamaha Super Feel Forged (1st Gen), 40th Anniversary Burgandy/Gold/Silver 23"
Uukha Vx-1000 X-Curve limbs were really bizarre to me (I had two sets: #42 longs for my Rapido and #46 mediums for my 27" risers). I measured them with a scale and they would increase weight about 1.65 lbs per inch, which is well under the "traditional" increase of around 2-ish lbs. per inch. What's strange is that these limbs FELT like they were stacking, even though they weren't. It's possible that the extra amount of draw added by my fingers pushed them over some sort of limit at which point they started to stack, but I doubt it. It's also possible that the lighter increase fooled my brain into thinking that my muscles didn't have to work as hard and therefore made them feel as if they were stacking. Regardless, these limbs were horrifically unforgiving and I could never get used to them. In fact, when I switched to my "emergency" set of Hoyt ZR-330 fiberglass/carbon/maple limbs, my scores went up immediately and significantly even thought they clearly had inferior cast. Archery (and many equipment-specific sports) often promotes a "more expensive, more technologically advanced equals more points" formula, which simply isn't accurate in a lot of instances. No matter what, I wasn't going to fight what was going on, so I retired them and moved them on. The EXE Magnetic Jet plunger was an interesting experiment, and I wanted this to work out so badly. I actually owned four of these, but eventually moved all of them on. or returned them. I honestly feel that magnetic resistance is superior to spring resistance since the amount of pressure exerted against the button is very constant throughout the majority of its stroke. This is certainly superior to plungers with short shanks like the Shibuya DX (a plunger I've never liked because of the amount it stacks) and probably even long shank plungers like the Beiter. However, what was bad about these plungers was the face that their internal actions were very scratchy when the plunger button was rotated at certain angles. This make the plunger's action *very* inconsistent. This was made worse when the plunger was pressed from the side, as a non-centered arrow might. Nika Archery plungers are obviously Beiter clones, but the parts aren't completely interchangeable. I'm not sure if the barrels will resist rusting as well as a genuine Beiter plunger barrel will, but since I just use these on my practice bows, I don't really care. The springs included with them are horribly scratchy, but if you replace the spring with a genuine Beiter spring, the plunger becomes just as smooth as a Beiter plunger. The same is true for the "FX" plungers I've been finding on eBay. Topoint P604 Stabilizers - These are the best stabilizer deal out there as of 2019. Rods are plenty stiff enough and they come with a Doinker A-bomb-style dampener and 7 ounces of steel flat weights. If you wait for a sale on AliExpress, you can get an entire set of stabilizers (again, including dampeners and weights) for less than $100. The only thing you might have to do is to re-epoxy either the endcaps or weight anchors as the quality control isn't the greatest on these. The Topoint P602 stabilizer is similar, but it has a built-in dampener like the Intech-3 stabilizer; these built-in dampeners are *horrible*, tho, so don't get the P602. The Bosen RC-5 "Double Carbon / Bamboo" limbs I have were the surely first in the country (probably the entire hemisphere--maybe even the world outside of China) as far as I could tell since I was in contact with the manufacturer when they were just planning these limbs and had them shipped the moment they came off the manufacturing line, several months before they were advertised. They're a carbon belly/back limb with a single-layer, wedgeless inner core. They're carbon matte with only a "Bosen Bows" decal on the top and bottom to identify them. They're marketed to hunters and thus come measured in 5 lb. increments measured on a 25" riser, seemingly with the bolts all the way out (I think they're measured at 26.25", not 28"). They're plenty smooth and fast, and I believe they're competition-capable and look really nice and understated. These limbs have incredible torsional stiffness. It's probably the carbon they chose to use, which is probably what's also causing the moderate stacking at the back end exhibited by these limbs along with the wedgeless design (these limbs start to stack a LOT after 30", which is ok since my draw is around 28"). At the poundage I'm pulling the limbs I have marked as #45, I normally use NPX-T 550s; these limbs, however, want 600s, which is the loosest spine that I even have in my arsenal.​ I believe the Bosen RC-3 Double Carbon /Foam limbs will be really good performers, too, but they top out at #44. I like the Avalon Tec-X series of sights as I believe they're a license-made copy of the Sure-Loc FITA sights I've been using since the Extreme came out way back in the day (either that or Avalon took over the tooling when Sure-Loc started to upgrade their line). The Tec-X (compound) works good as Olympic sights so as long as you don't run your carriage all the way down to the bottom (so, you have to have enough #age or you're using them indoors). I ordered a Tec-X Olympic sight the moment I saw it come out (I think I have the first one on the continent) and like it just fine. I noticed that the click on the windage/elevation knobs aren't quite as "positive" and they're a little smaller in diameter as they are my Sure-Locs (they work fine, however), but other than that, I think they're the same sight. My Border Hex bows are sortof "play" bows for me as they are really unforgiving, which I actually like since they help me perfect my form. They are hella fast, though, no doubt about it, and they're really fun to shoot. If I can ever get to the point where my form is consistent enough, I might think about shooting competitions with these. Honestly, I believe my Fivics Platinas are the best risers I've ever owned with the exception, possibly, of my Sky Conquest. They have built-in vibration reduction in both the grip and in the limb pockets, the limbs can be adjusted without taking them off the bow, and there's even a nice little wedge cut out so that you can place your arrow under the clicker with ease. The "hard anodized" coating, although not the prettiest, is really tough and makes the riser seem really solid. The Decut Basha Pro handle is an obvious near-copy of the Hoyt GMX and is a surprisingly excellent riser. It's almost too bad Decut sold it so cheaply as this probably turned a lot of people off to it as they weren't ready to view something so cheap as something of quality. Bummer--it's an excellent riser and is probably more than capable of Olympic-quality scores. I like using Decut Nova arrow rests. I have two Shibuya Ulimate rests, and they are similar in that the bar/rest can be adjusted in both dimensions. However, the magnet is much, much lighter--just enough to take the rest back out to ready position, but it folds really easily compared to the Shibya, thus lessening any clearance problems that might arise if something happens to de-tune your arrows. I had to purchase a set of PSE Achieve limbs as an emergency replacement set. Now, I use them on my low poundage bow. These are advertised in the 2018 catalog as being of carbon/foam/wood construction, but probably carbon/foam Samick Discovery R3s and don't contain any wood. I like them, FWIW, although I paid $40 for overnight shipping, but because of the way their factory shipping works, I effectively paid all of that dough for three-day shipping. I still have a bitter taste in my mouth thanks to that and it'll probably cost PSE any future sales from me. In any case, these are a single-layer, wedgeless design the same as my Bosen RC-5s and KG Archery NX-55s, and the spacer material is *probably* foam (not maple/foam, as the 2018 materials state). I'm sure they're Samicks since their sticker is still on the limbs and I believe (this isn't as evident) that they're actually re-branded (well, really, just re-labeled since the Samick sticker is still on them) Samick Discovery R3 limbs. They're decently smooth on the pull, but the limb tips are chunky (although the grooves are nice) compared to any other limb in my arsenal, and because of that, there's a somewhat high amount of post-shot flutter. I'm fairly sure the chunkiness is at least due, in part, by the wedgeless design. The finish (exactly the same as Discovery R3 limbs) is a matte black that shows scratches pretty easily. The graphics are uninspired and sortof tacky. They're average limbs except for the post-shot flutter, which I think is a bit worse than average, especially compared to wedged limbs. I own both a set of KG Archery NX-55s and KG NextGen limbs. The NX-55s were KG's top of the line offering when I was given them as a present in 2018 (they might still be at the time of this writing); the NextGen limbs were their previous top-shelf limbs. The obvious difference to me is that the NX-55s are wedgeless whereas the NextGen's are wedged limbs. The other difference that I noticed is that the recurve on the NX-55s are somewhare more pronounced wereas the NextGen's curves are pretty much Hoyt geometry. The fit and finish on both limbs are excellent and what makes me happy to purchase from small boyers. On the NX-55s, you can custom order the primary color of he graphics, which I really appreciated when I put them on my riser. I like them both--the NextGens have a pull profile really similar to my old Sky and Hoyt recurve limbs. They have a confident back end and are smooth throughout whereas the NX-55s are a bit quicker to weight, but a bit more "modern" on the pull, for the lack of a better way to put it. They both shoot well and are just shy of their more well-known counterparts in terms of speed. I think KG somewhat missed the boat with the NX-55s, however, when they made them single-layered, wedgeless. I suppose they did this to try to hold down costs and time-to-manufacture a bit, but my guess is that they could have been made even smoother and faster if they would have used a two-layer design. In fact, this choice is what stopped me from purchasing a set to use as my competition limbs on Purple Rose. I wouldn't hesitate to have another set of them, however, as they are a high quality set of limbs. These are measured at 28", if anyone is curious. My Win&Win WIAWIS NS-Graphene / NS-G limb Review: So, after shooting these a fair amount for the past few weeks, I generally can say that these limbs are made for a high level shooter. In general, they build to weight faster than a "standard" limb and then feel fairly stiff throughout the rest of the shot cycle. I suppose one might say they're stacking, but this isn't right as what they're doing is providing a fairly confident back wall without actually increasing in weight nearly exponentially as limbs do that really are stacking. As such, it's easy for me to determine where the point of the arrow is just by feeling the weight of the limbs--I'm considering not looking at the arrow tip anymore since I can predict, within about 2mm where the point is. I don't honestly think a beginner or even intermediate archer would benefit from these limbs unless their coach believed there were real value in having this stiff of a backwall. If you're not absolutely aligned properly and expand without a definitely strong motion, these limbs will feel about 2x-3x heavier than they ought to. If a coach wanted to teach a student the difference between good alignment and bad by how easy limbs will expand through, then these are probably a good choice? If a coach wanted to teach smooth motion, then these are an incredibly bad choice. The limbs are incredibly light--I haven't weighed them, but my two competition bows are exactly the same except for the paint color; they even have the same Jager grips with the little rubber palm pad thinggie. Purple Rose (the bow with these) is definitely and absolutely lighter than Geaux Tiger with my carbon/maple KG Nexgens mounted on them. So much ligher than I might have to add more weight to compensate. On top of that, their cross section is really thin--my guess is that they're the same as the NSes in this regard. As a quirky aside, the dovetail slot on these fit so tightly around my FIVICS limb bolt that I wish I could pay Lou Ferrigno to hang around until I was ready to disassemble my rig. Whatever the clear unobtanium they use in he wedge is incredibly hard (is it glass??) and when I run the limb back and forth to try to get it off, it scrapes and screams like I told it it couldn't go outside to play in the snow. They sound like they're breaking as I press and pull on the limb and riser to get them off. It's sortof embarrassing when I'm taking it down around others and twice people have come over to help me by playing tug-o-war with the damn things (one of them was Mackenzie Brown, so that was kindof cool). I'm afraid to lubricate or file them for obvious reasons. There is a bulge that's starting to wear thanks to the tight fit, but it's only INSIDE the groove, which won't help when disassembling these bastards. I don't know if the fault lies with Win&Win or FIVICS, but all other limbs I own pop off of my Platina and Titan risers without complaint although none of those are made my Win&Win. As far as after the release, so as long as your brace height is set properly, these are the most beautiful limbs I've ever owned in this regard. Confident and fast, there is very little post vibration and they're quieter than any limbs I've ever owned. Rob Kaufhold said they sounded beautiful as that was the first time he'd ever heard these limbs being shot (I was somewhat impressed that he would comment given I had set up my bow so well with such a limited amount of time). It's true--they're great, although one thing I noted was that the pitch of the limb report was substantially higher than any I've ever heard before. Bizarre; not sure what's going on there. Might be the unobtanium in the wedge. They're forgiving of brace height for the most part and have great range, but they are a bit binary as they are either "on" or "off" with very little in between (I settled on 9.25" on my 70" rig). My general setting for tiller is dead even, and they were wonderful at that. I moved to 1/8th lower on the bottom limb just to see what happened and I didn't detect any noticeable change except for the arrow landing somewhat higher. However, when I moved to 1/4", things went very, very far south and the bow vibrated on the shot so much that my hand actually went numb, which is something I've never experienced before--holy cow. I don't normally run my bows any more than 1/8", and given that these limbs are stiff, my guess is 1/4" on the bottom or top difference will make that limb work a LOT harder compared to most other limbs. If I had more time or were more skilled, I might have been able to ameliorate this (maybe? ), but I didn't bother since 1/8" is usually the most I go, to begin with. As far as the shot, there's no doubt that these are fast limbs--certainly the fastest I've ever owned and probably one of the fastest (if not the fastest) on the market. I haven't chronograph-ed them yet, but I can just tell from the arrows as they're casting that they're incredibly quick downrange. Surprisingly for high performance limbs, they're somewhat forgiving in certain conditions. A somewhat weak finger release (still with back tension, mind you) or bow arm push is about as forgiving as other limbs, but even the most minor pluck or creep is punished with great malice. Again, at the rate these are increasing in poundage (again, this is fairly linear, not exponential), any minor variation in length when the arrow upon loose is anti-rewarded for your "efforts." Those in my branch of the Arnold/Higuchi clan are big bowlers! I've rolled in many, many leagues. My high score is a 289. I participated in all of these at one time or another.